We must remember, not everything that counts can be measured, and not everything that can be measured counts. Parrinder Hide, Shoveler squirting water and Avocet standing on one leg in gale. I see the RSPB has deservedly won a couple of architectural awards from the Royal Institute of British Architects (RIBA). 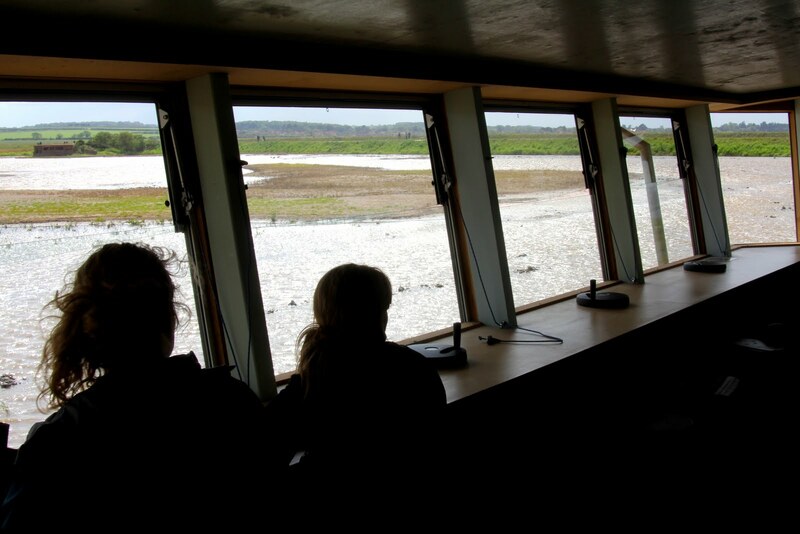 The new Parrinder Hide at Titchwell and the Marshland Discovery Zone at Rainham are both exciting new structures that I have commented on before. Excellent, half a job done. The other half is what is outside the window and is the bit (sorry architects) that will entice most of us back into the building time and again. What is it that makes us sit in the building longer than a quick warming of the new swivelling, plastic seat? A great hide provides a view that reveals more and more the longer you look. 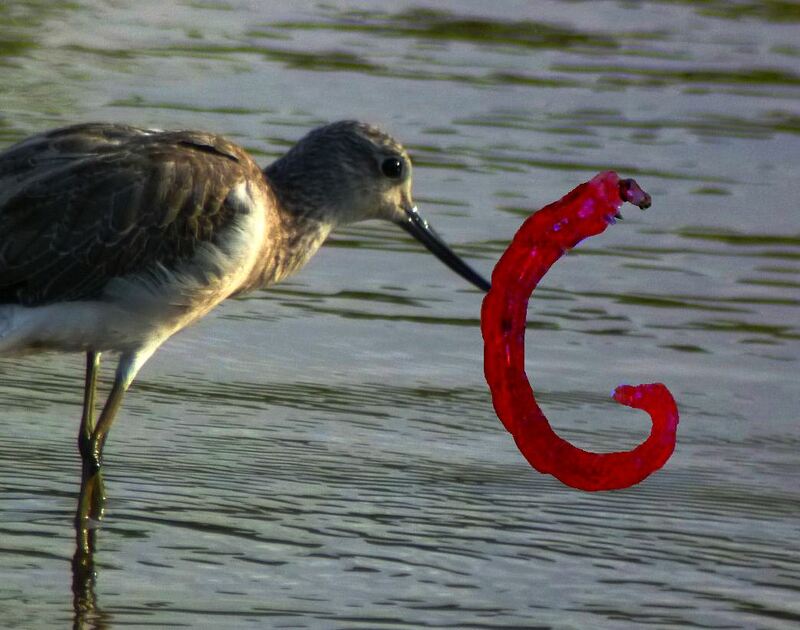 Great close-ups of common birds and other wildlife. Or perhaps spectacular flocks of birds. Or an unexpected look at something familiar. Some fascinating behaviour revealed, or an element of surprise, something which just a walk down the path would have missed. Nooks and crannies of habitat or landscape to look into, with new things appearing the longer you wait and watch. The chance of a rare bird! Such things that are stimulating or exalting to the spirit are often difficult to measure and certainly can be even more difficult to achieve. So I decided to launch a new award: The Grumpy Ecologist’s ‘Most inspiring view from a box’ award. And by chance, I was back at Titchwell yesterday, looking at progress over the last year. The fresh marsh has been rejuvenated, years of encroaching vegetation rolled back and new islands created. Early days yet but 80 pairs of Avocet seem to like it, and this spring has provided good views of birds such as Temminck’s Stint, Red-necked Phalarope and Gull-billed Tern. None there when I visited of course, but I enjoyed close up views (on a lousy day) of feeding Avocets, godwits and Shoveler, wheeling flocks of tundra Ringed Plover and Turnstone, and Marsh Harriers drifting back and forth. 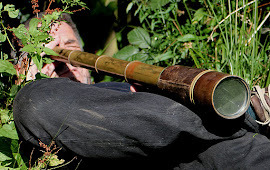 So the first winner of this soon to be prestigious award is: The Parrinder Hide at Titchwell. Nominations for the next award gratefully received. I love these new hides but it’s what you see from them that counts. It doesn’t take Einstein to work that one out. 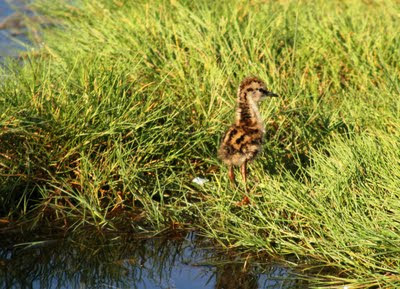 Good and bad; Redshank chick and cracked mud. Another dry spring is upon us and breeding waders in wet grasslands are suffering; site after site is baked hard and cracked. Teeth are sucked and heads are shaken. “Not much we can do – it’s a dry spring” are the usual comments. Quickly followed by “And predation is really bad this year”. Well, it is surely no surprise that the two are linked. 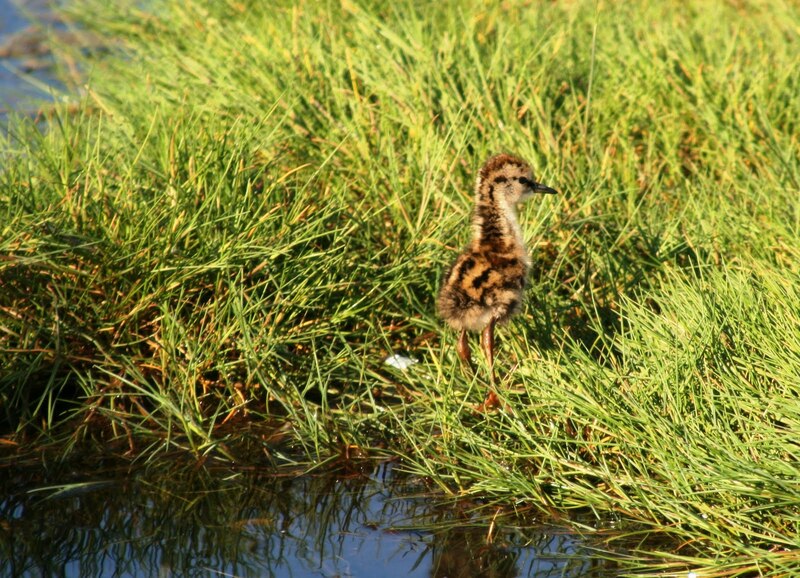 Drier habitats result in poorer feeding opportunities for waders and allow mammalian predators easier access to the nests and chicks. Overall, more are predated. 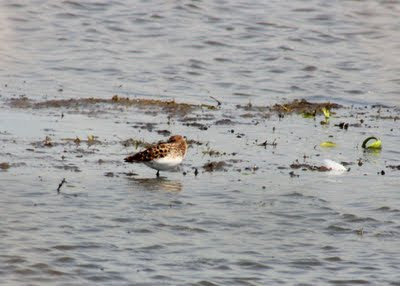 With very dry springs, breeding bird numbers crash as waders such as Snipe, and duck, seem to give breeding a miss. I’ve looked at a dozen or more sites this spring and those that are performing well (and appear to have less predation problems) are those that remain wet. So the key is to get the habitat into top condition. But we've now had several dry springs in succession. There is a lot of talk a lot about climate change, how this might affect wetland reserves and what we can do about it. The simple answer is that we need to adapt our management to these changing conditions and one solution is to store more winter rainfall where possible. If just an extra 10 cm of water is held in pools or floods at the end of the winter, what difference would it make? Well, if it were a breezy, sunny April, up to 5 mm of water may be lost through evapo-transpiration on the warmest of days. So, on average, an additional 10 cm of water is likely to provide an extra month of wetness and this could make all the difference to breeding birds. One reserve I looked at had put extra water on ‘by accident’ in one compartment. It was the best looking area on the site and had a high concentration of breeding birds. Many sites seem overly cautious about raising winter water levels and even let excess water run away. Climate change is upon us, we need to be more adaptable and one action is to store more rainfall when it is delivered. Freshly emerged Broad-bodied Chaser, emerging Large Red Damselfly and pair of Large Reds 'in tandem'. I have dug a pond in the garden of every house I have lived in. A year ago I completed my latest creation - a modest 2m x 2m effort. Last Sunday, exactly a year on, I spent the day watching literally hundreds of damselflies emerging. I watched larvae swimming to emergent vegetation stems and clambering out of the water, often over others, to emerge as adults. Some even climbed a metre to the top of a sundial placed tastefully by the waters edge. I've recorded 6 species of damsel/dragonflies at the pond over the year and three emerged on Sunday. Large Red Damselflies were by far the most numerous, the empty larval cases clinging to every bit of vegetation. There were also a few Azure Damselflies and a handful of Broad-bodied Chasers. Little was originally added to the pond other than a few plants scavenged from the local gravel pits and a bucketful of sludge. 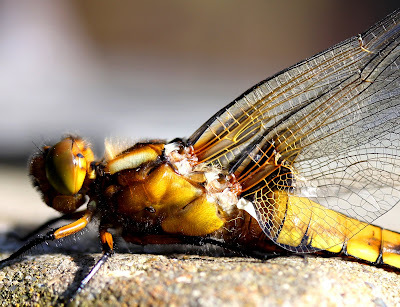 Today the pond has 3 species of amphibians, mayflies, water-boatmen, tadpoles, dragonflies and more. Best enjoyed on a sunny day, sat on a nearby strategically placed bench, with a glass of red. Brilliant. A long look around Old Hall Marshes shows this reserve to be in good shape. Old Hall retains extensive areas of old coastal grazing marsh by the Blackwater Estuary. Grazing of these ancient marshes, since their enclosure in the Middle Ages, has created a characteristic undulating landscape, with the channels of the old saltmarsh creeks still evident. The ant hills of the Yellow Meadow Ant, estimated to number in excess of 500,000, give credence to the antiquity and uniqueness of this landscape. The variable topography of the grazing marsh, combined with a carefully manipulated water table and grazing regime, creates a fleet-type habitat ideal for breeding waders and duck: the depressions formed by the old creeks and salt pans retain water, while the tall, aquatic vegetation and tussocky grazing marsh sward provide nesting cover. Around 100 pairs each of Redshank and Lapwing nest, along with numerous Pochard, Shoveler, Tufted Duck and Gadwall. This is undoubtedly the best site of its type in Essex. 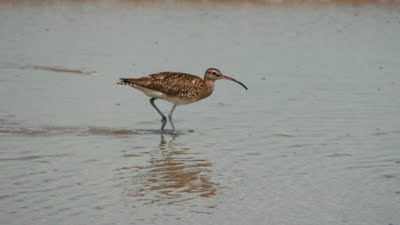 Old Hall is also highly important for passage waterbirds and a visit in late April/early May is virtually guaranteed to produce at least a few Whimbrel (locally known as Titterel in the past). My visit produced a respectable 87, although spring peak counts in recent years have reached 250, making Old Hall an important site nationally for this species. With the scrape on Bale Field in excellent condition, the day’s wader list amounted to 19 species, including single Little Stint, Curlew Sandpiper and Wood Sandpiper, and several Spotted Redshank and Greenshanks. A year back, I blogged about the Avocets at Old Hall. Well, last year they did well, with 59 pairs on Irongate rearing 50+ chicks. Good numbers appear to be settling this year also. 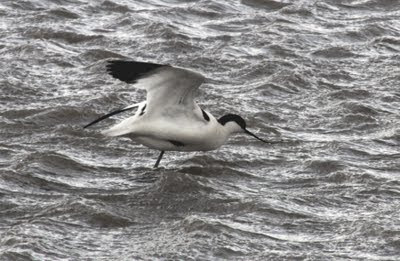 The Avocets moved to Irongate following erosion of the nesting islands on the brackish lagoon at Pennyhole Bottom. These have been restored, and with further work to come, should provide an alternative nesting site, and be in good condition to host autumn passage waders. It’s a long walk around the 11.5 km of seawalls, but there are birds at every turn. As waders pile through northwards as spring progresses, and we search for those that drop down to muddy pools, we might ponder what they are eating. Now I have always been a fan of the humble chironomid, the ‘non-biting midge’, such that my CB ‘handle’ on the Isles of Scilly (back in the days when a CB was the height of fashion) was ‘Billy Bloodworm’ (bloodworm = chironomid larva). These little beasts play a key role in many a food chain, notably forming an important component of the diet of many birds. 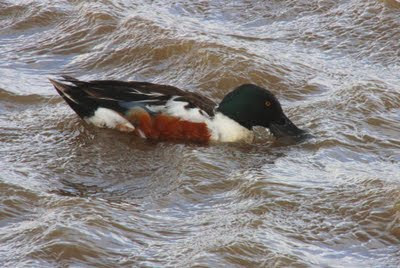 Pochard have been found to dive selectively over areas with high chironomid larvae densities. In one study, they formed 80% of the spring diet of Pied and Yellow Wagtails. Furthermore, the pupa, emerging sub-adult and adult insects are vital for breeding duck, forming a major food item for ducklings. 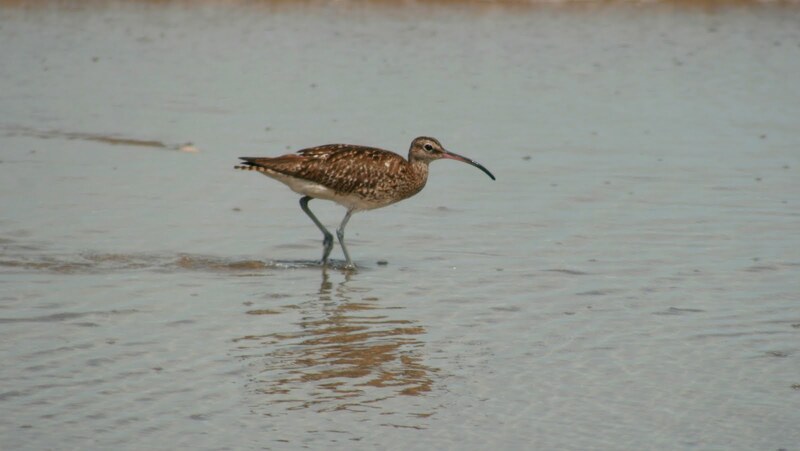 And of course those passage waders; we know they stop and feed at wetlands where high densities of larvae are available at appropriate water depths (54-84% of diet in one study of 4 calidrid species). Nothing much new here perhaps, but how many sites deliberately try to maximise this food at the appropriate times? Many other things eat chironomids as well, for example, bigger invertebrates and fish. 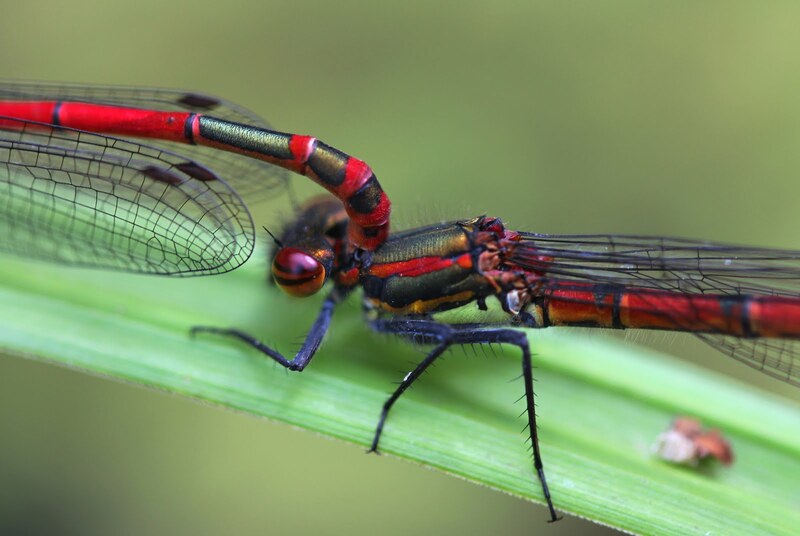 But chironomids can rapidly colonise new wetlands and reach high densities by exploiting the nutrient flush resulting from flooded decomposing vegetation, before being pegged back by their predators. So managing early successional wetlands (‘scrapes’) to maximise their biomass is possible; any reserve manager worth their salt should be thinking a lot about the requirements of these little critters. Chironomids have a large range of foods, however, algae and detritus are commonly consumed. Temporary pools frequently have high production levels of chironomids. Flooded vegetation within pools acts as both a substrate for the larvae and food source, first as a substratum for algae, then as a source of bacteria as it decomposes. So, a careful rotational management regime of flooding, drying, vegetating, grazing (dunging), rotovating and re-flooding should all be considered to get the best out of Billy Bloodworm. So how often should ‘scrapes’ be allowed to dry out? Chironomids pass through four stages: egg, larva, pupa and adult midge. The last two stages are generally very short. 33% of studied species have one generation a year (uni-voltine), 44% have two (bi-voltine) and 18% have several. Uni-voltine species mostly emerge in spring/summer and pass the winter as mature larvae. Bi-voltine species usually emerge in spring and autumn. So, flooding for 12-18 months, before drying might be ideal. With several scrapes being flooded and dried in different rotations, maximum production might be achieved. Drying scrapes in spring by 2-4 cm a week, to reveal mud and shallow water of 2-5 cm should make enough chironomids available to feed a succession of those passage waders. Let’s hear it for Billy Bloodworm.